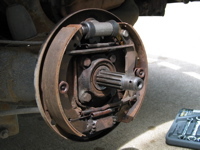 In July of 2006, the Beetle's brakes started to break again. 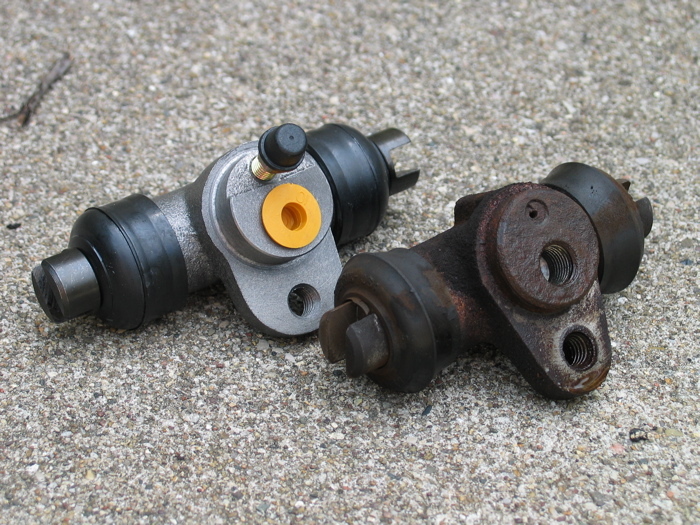 When doing the master cylinder replacement the previous fall, we discovered that the two rear wheel cylinders had broken-off bleeder valves on them. This lead to a pretty bad job of bleeding the brake lines, and this bad job had finally caught up with us. 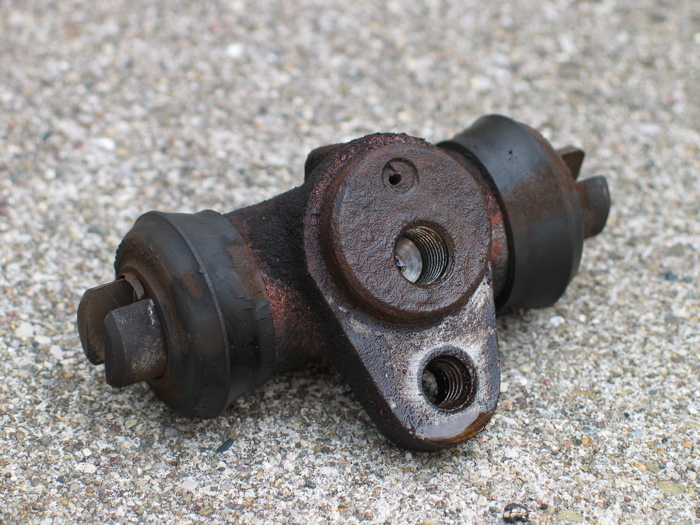 It was time to replace those two cylinders and get the bleeding done correctly. 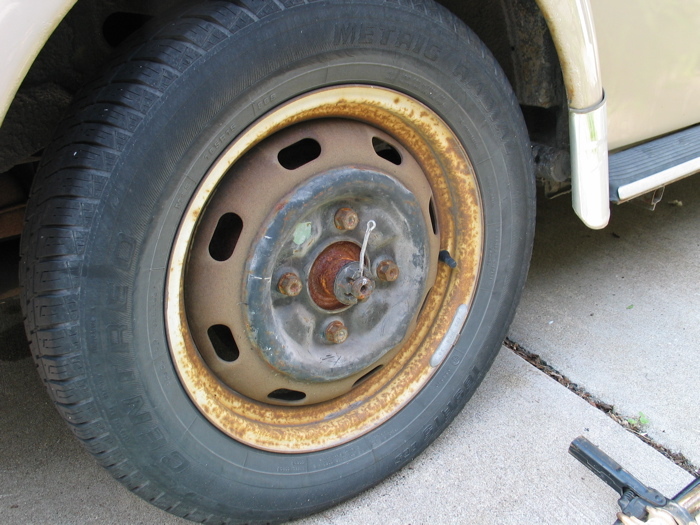 First we had to get the wheel off. Here you can see that I have already taken the shiny hub cap off; beneath that are the four lug nuts and a big 36mm axle nut. Holding the axle nut in place is a cotter pin. 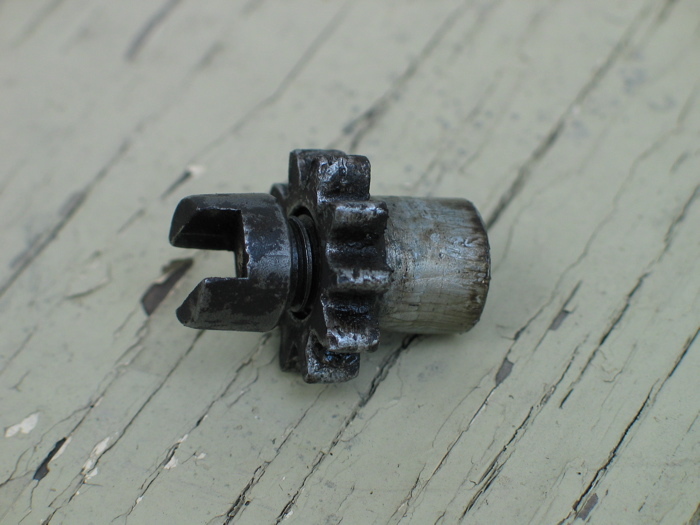 I've pulled that pin mostly out in the picture and am ready to attack the giant axle nut. Note that the car is on the ground at this point - you don't want to fight with that axle nut if the car is lifted up. 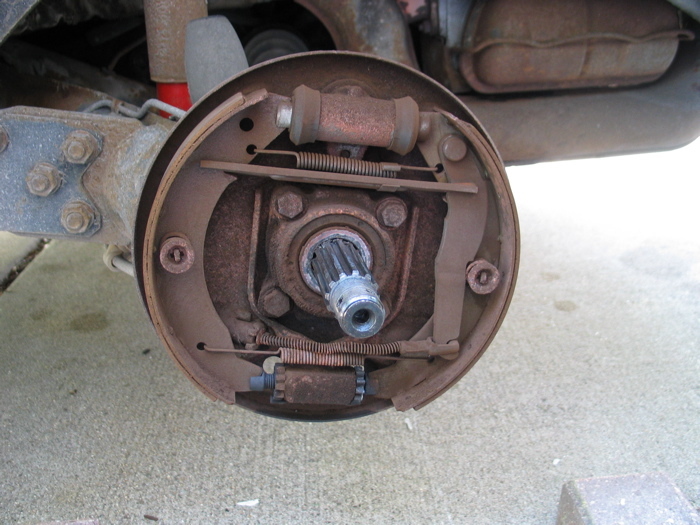 Once you've finally loosened that nut and slid the wheel off the axle, you're greeted with the view seen to the left. 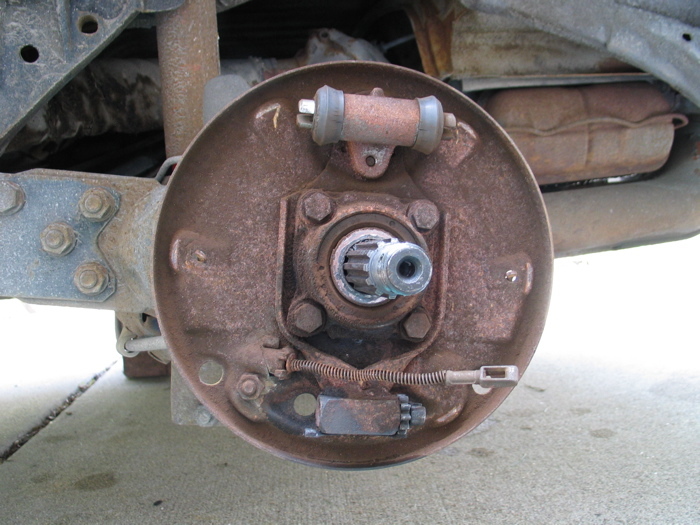 The shiny silver shaft in the middle is the axle, of course, and the two moon-shaped pieces on the right and left edges are the brake shoes. The cylinder at the top of the assembly is the part we are here to replace. 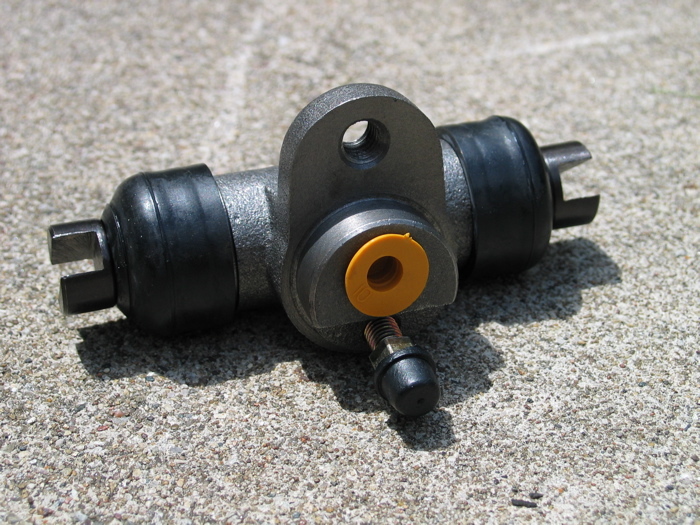 Coming out of the back of it is a metal brake line that runs up to the front of the car and into the master cylinder. When you stomp on the brakes, the goo in the master cylinder is compressed and the only place it has to go is back through the tubes and into the wheel cylinders. 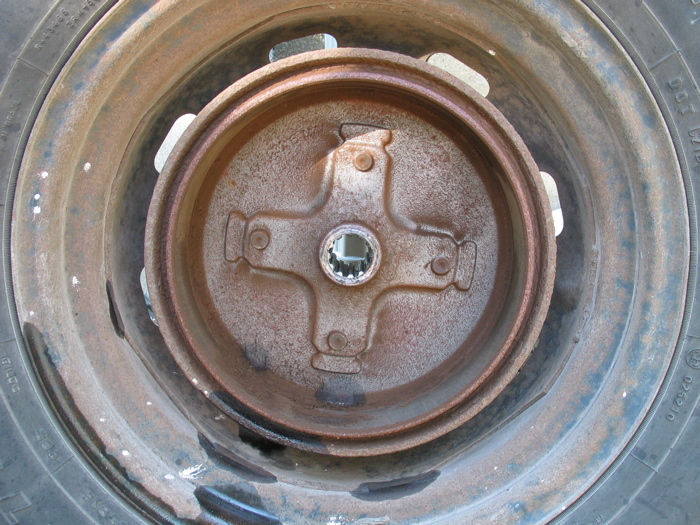 These cylinders expand to the right and left (top and bottom in the front), pushing the brake shoes out against the drum (that came off with the wheel). Simple! The block on the bottom holds the adjusting stars that are used to get your brake pads lined up nice and close to the drums. Finally, note the wiggly spring sitting above the bottom-most spring. Inside of that is the emergency brake cable. When you yank up on the emergency brake inside the car, it just pulls that cable tight and causes the brakes to do their thing. Here's what came off when we pulled the wheel off. The thing in the center of the wheel is the drum. 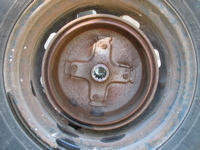 The hole in the middle is where the axle runs through. Meanwhile, back to the innards. 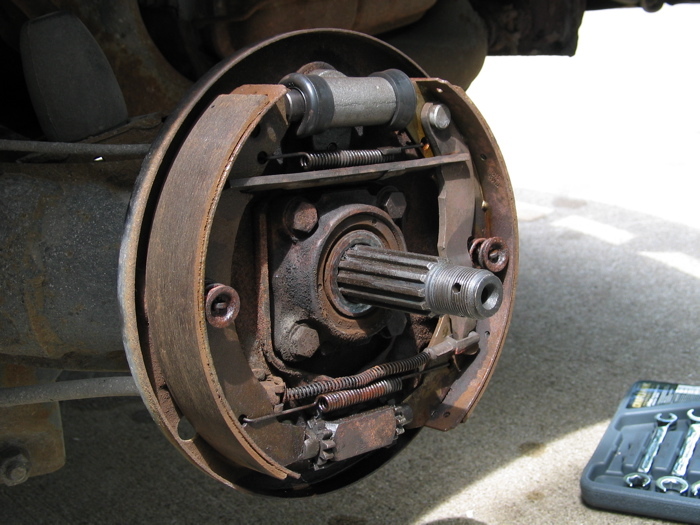 Here I've taken all of the brake shoe assembly out, leaving only the things that are bolted in. To get the shoes off I just had to screw the adjusting stars all the way in to create some slack and then twist the pin inside of the shoe pivot points to slide them off (see a couple of images up for these pins - they're inside of springs at three o'clock and nic o'clock in the assembly). You can see I have also taken one of the adjusting stars out at this point; I took both out of both wheels while doing this so I could clean them up. Now they are a lot easier to work. 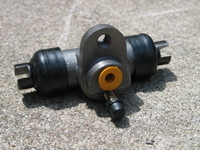 Again, the part we want to replace is the cylinder at the top. It is held on by a bolt that comes through from the back. 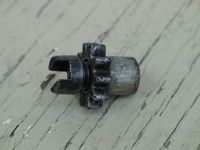 You can see the end of the bolt sticking through the hole the bracket on the bottom of the cylinder. 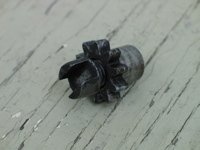 Here's one of the new cylinders, with its caps still in place. This one is laying upside down on the concrete for the photo shoot. 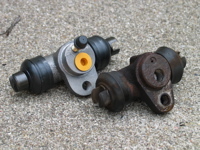 From the bottom up you see the bleeder valve (with the black cap), the brake line port (with the yellow cap), and the bolt hole. And there it is! See the little tub on the ground under the car? That's what I used to catch the brake fluid that came pouring out when I disconnected the brake line. Be sure to have sometime similar ready as well as a thin object to cram in the hose while it is disconnected. I used a thin rag wrapped around the tip of a pencil. Working with brakes sure is messy! Here's the old cylinder. This one is laying right-side up on the concrete. Working our way down, we see the broken bleeder valve (thhat's one of the reasons it was replaed in the first place), the brake line port, and the bolt hole. Here's a shot of the new vs. the old. Guess which is which! After cleaning things up some, I put it all back together. There's the nice new cylinder with the pretty shiny adjusting stars. Speaking of the adjusting stars, here's a word of caution: they're not symmetrical. 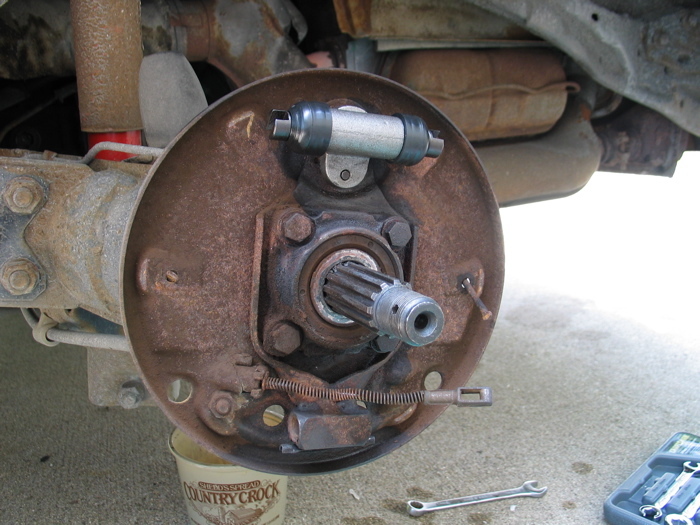 The little notch in them is at an angle, and it needs to be lined up so the brake shoe fits into it correctly. Here's one view of the angle. And here is the other view. If you look carefully, you'll see that I had them upside down on the reassembly picture above - the thin side should be up, and the thick side should be down. After all of that work for one wheel, you just need to do all of the same things for the other side. After the new cylinders are in place you'll need to adjust and bleed the brakes, two tasks that don't lead to good pictures. However, after spending way too long playing around with the adjusting stars I did create this picture to help out. 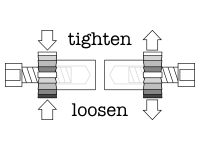 Note that the arrows show which way the stars turn; when working them through the little holes, your screwdriver will probably be levering in the opposite direction.